Born in France, I moved to the Uk in 2014 as an aupair. This wonderful experience with children has been the best of my life. I am now living in Penarth with my partner and two dogs and miss speaking french. I have spare time to spend (beside writing novels) to teach my native language. 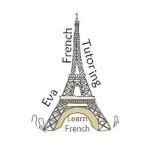 ​I have 24 years of experience of speaking french. I passed all my degrees from CGSE, A-levels and HNC/HND to specialise as an Administrative Assistant. I have great experience with kids and adults. I love communicating and helping others in anyway I can.